The Philadelphia Eagles and Pittsburgh Steelers, having both finished with 8-4 records to create a tie atop the Eastern Division, faced each other in a divisional playoff game on December 21, 1947. It marked the first postseason appearance for each of the franchises, who both came into the NFL in 1933. The Eagles, coached by Earle “Greasy” Neale, finished second in each of the previous three seasons and a late-season slump, in which they lost two of their final four games after getting off to a 6-2 start, had nearly deprived them again. HB Steve Van Buren set a new league record with 1008 rushing yards and QB Tommy Thompson (pictured above) was a fine passer and had good targets in ends “Black Jack” Ferrante and rookie Pete Pihos, all playing behind an excellent line. Neale’s innovative defense was tough and very physical. Very little was expected of Pittsburgh coming into the season, especially when they traded star tailback Bill Dudley to the Lions. But Head Coach Jock Sutherland’s team won six straight games after getting off to a 1-2 start. The Steelers utilized a single-wing offense ably directed by Dudley’s replacement, tailback Johnny Clement, and they had a productive receiver in end Val Jansante. They had beaten the Eagles earlier in the season at home, but were missing several starters, most notably Clement, due to injury in losing the rematch at Philadelphia. All were back healthy for the playoff game, and Pittsburgh also concluded its season a week earlier than the Eagles and thus had an extra week off prior to the playoff game. However, there was also discontent among the players, who demanded extra pay for the additional week of practice, which drew the fury of Coach Sutherland and sowed the seeds of dissension. There were 35,729 fans in attendance at Forbes Field. Pittsburgh managed just two first downs in the first half, the first of them coming on their first possession of the game. Philadelphia’s first scoring threat came up empty when the Eagles faked a field goal and QB Allie Sherman’s long pass intended for Jack Ferrante was incomplete. The Eagles got their next opportunity when Pete Pihos blocked a punt by Bob Cifers, which gave the visitors the ball at the Pittsburgh 14. Two running plays netted the loss of a yard, but on third down Tommy Thompson threw to Steve Van Buren for a touchdown. 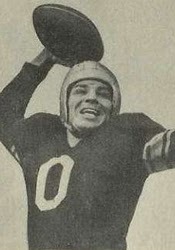 Cliff Patton added the extra point for a 7-0 lead. Early in the second quarter, Philadelphia put together a 69-yard scoring drive after HB Pat McHugh returned a punt 11 yards. Thompson threw to HB Russ Craft for eight yards and a 15-yard penalty for unnecessary roughness was tacked on following the play. Six plays later, Thompson threw long for Ferrante and it was good for a 25-yard TD. Patton again converted. On the first play following the ensuing kickoff, Johnny Clement carried around end for a 27-yard gain to the Philadelphia 45. It was Pittsburgh’s first penetration into enemy territory, but the series stalled thereafter. The score remained 14-0 in favor of Philadelphia at the half. After passing to good effect in the first half, the Eagles kept the ball on the ground and played conservatively in the second half, especially after Thompson was injured and had to leave the game. Early in the third quarter, HB Bosh Pritchard (pictured below) fielded a punt and returned it 79 yards for a touchdown in the game’s most spectacular play. Patton again tacked on the extra point. Late in the third quarter, the Steelers finally put together a promising drive as they advanced from their 34 to the Philadelphia nine. Clement, Cifers, and FB Tony Compagno all ran effectively and Clement completed a pass to end Elbie Nickel for 16 yards. But facing fourth down, Clement tried a jump pass, fumbled, and while the Steelers recovered, they were short of first down yardage and had to turn the ball over. It was their last gasp, and the Eagles coasted the rest of the way to a 21-0 win. The statistics reflected the score as Philadelphia outgained the Steelers (255 yards to 154) and had far more first downs (17 to 7). Each team turned the ball over twice. Tommy Thompson was outstanding as he completed 11 of 17 passes (10 of 15 in the first half) for 131 yards and two touchdowns. Steve Van Buren was held to 45 yards on 18 carries but also scored a TD on one of his two catches for 15 yards. Jack Ferrante led the Eagles with five pass receptions for 73 yards that included a score. For the Steelers, Johnny Clement (pictured at right), out with an elbow injury for nearly a month, led in rushing with 59 yards on 14 carries but had a poor passing performance, completing just four of 16 throws for 52 yards. 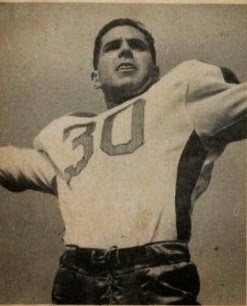 Val Jansante failed to catch a pass and Elbie Nickel led the club with two receptions for 32 yards. The Eagles went on to lose an exciting NFL Championship contest against the Chicago Cardinals. They came back to win the Eastern Division in each of the next two seasons, coming out on top in the league title contests as well. As for the Steelers, Coach Sutherland died from a sudden illness during the offseason and was replaced by John Michelosen. Pittsburgh dropped to 4-8 in 1948 and did not return to the postseason until 1972.